The Ukrainian part of the Exclusion Zone (with a radius of 30 km) covers several contiguous districts of Kiev and Zhitomir Regions. The total area of the territory, which was home to 116,000 people in 94 settlements prior to the disaster, comprises 2,600 km², an area slightly larger than Moscow. The length of its external perimeter, with its barbed wire fence, checkpoints and radiation-monitoring points, is around 440 km (the approximate distance between Moscow and Nizhny Novgorod, or Paris and Amsterdam). Inside the ChZO, certain regions are subject to a special access regime, covering tens of square kilometres within the Zone and the area in the immediate vicinity of the power station. 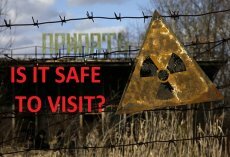 The biggest hit from the radiation contamination was received by Pripyat where many citizens were much younger than 26. The city shone brightly with its decorations, upgrades, and infrastructure elements. A train station, a small functional port, an advanced hospital, and a huge attraction park. Everything seemed lively on the day X. When the blast shook the lands, local authorities did not warn people. People were not provided with much needed iodine medications that help fighting off poisoning. The acceptable levels of danger and radiation were exceeded by thousands times right after the second explosion. The process of moving the population started only 24 hours later on April, 27 of 1986. People were asked to take only things vital for survival. To avoid stresses and riots, the officials promised that everyone will be back in 3 days. 3 days after, the government decided to abandon the town altogether. First to leave the town were children and women. A massive issue was the amount of public transportation required to relocate the population in a timely fashion. Just to transport over 50 thousand people, hundreds of buses were moved here from other regions the Union. The bus line extended to more than 25 kilometers. The line was so long that when the head crossed the border, people in the tail were not able to make out the silhouette of the NPP anymore. In less than 3 hours, the whole town became ghosted. This is how it will keep on resting from now on. The day was 5th of May and the government started evacuating all who lived within the radius of 30 kilometers from the blast. Nowadays, visiting the zone is strictly prohibited and allowed only to people who visit the cemetery. At the present time, around 300 samosely or “squatterrrrs” live in eleven settlements inside the Exclusion Zone – people who have returned of their own will to live in the abandoned houses. A village might have just one inhabitant, while the next could have three or four families in residence. The most famous samosel in the Chernobyl Zone is probably Granny Hanna. She takes offence at the term “self-settler”, however, as she has lived here all her life, simply returning to her own home. Background radiation levels in this village have now fallen to normal, but the land remains contaminated all the same. 83 year old Baba Hanna lives in the abandoned village of Kupovatoye with her 75 year old sister, who has been an invalid since childhood. They returned home almost immediately after the evacuation: Baba Hanna was unable to get used to living in town. There are four homesteads in the vicinity, one of which is home to her cousin Sofia. Baba Hanna has a small plot: a vegetable garden, a small garden and fourteen hens. Her problems are those typical of a simple villager: two years ago her chickens were engulfed by the winter snows, and wolves mauled her only dog. There are no shops here, but a car loaded with provisions comes twice a week. She steadfastly puts up with all difficulties, coping practically single-handedly with her work. The local police make periodic visits to the inhabitants, helping them with their husbandry. Granny Hanna is always happy to receive guests, but shoos away persistent tourists wanting their photograph taken with her, jokingly referring to them as “maniacs”. People began returning to their homes literally a few weeks after the explosion at the ChAES: some didn’t understand what radiation is, others thought it was just scare-mongering, and some didn’t want to leave their property, or simply preferred to die in their own home. In 1986, there were already 1,200 samosely, a figure that has now grown fourfold. 85% of those living here are aged over sixty. No children are born in the exclusion zone, though there have been exceptions to this rule too. On the 25th August 1999, a daughter Maria was born to the “self-settlers” Mikhail Vedernikov and Lidia Sovenko – the first and only child of the zone. She no longer lives within the bounds of the ChZO. In his research, Denis Vishnevsky, an employee of the Chernobyl Radio-Ecological Centre special state research and production enterprise, writes “The most characteristic trait of these people is their total lack of radiophobia. The system of arguments is simple and clear: “radiation cannot be seen and cannot be heard”, “the cat gives birth to lots of perfectly normal kittens”, and “we have no health problems”. The second characteristic trait is their self-sufficiency: they do not complain to the authorities and ask nothing of them. They look at everything with the wisdom of people who have extensive life experience and who have made their own important life choice”.